Brittany Basse, teaches eighth grade Science and Humanities at Baychester Middle School in the Bronx, New York City. The layers of challenges echo in her title alone – yet her candor, direct approach, honesty, and an unpolished sense of humor make it clear why she does not just survive but thrives in a teaching environment where turnover rates and morale are often in stark contrast. Attending conferences is always fun for us. This summer we attended National Marine Educators Association annual conference—and it was a BLAST! A highlight was meeting the enthusiastic (and, we mean enthusiastic!) teacher, Charlene Mauro who has been using Shape of Life in her classroom for 20 years. Charlene teaches at The Navarre Beach Marine Science Station- a unique fusion of formal and informal education. When we asked Lisa Uttal if she thought of herself as more of a teacher or scientist she quickly responded, “I can't decide which one-- I love doing both.” We could tell she had given it some thought. And, on the gorgeous sunny day we met Lisa at the Santa Cruz Wharf—there was no question that she had struck the perfect balance between science, education and communication. The kind of balance that can only result in a contagious curiosity about our oceans. Jeffiner Reynolds NSTA from Shape of Life on Vimeo. Protecting Earth, One Middle School at a Time. Take a gorgeous 75 degree California day, a group of rambunctious middle school students coming inside from lunch, and get them to focus on how the sun can be transformed into renewable energy. No problem for Angela Duke who teaches 6th and 7th graders about the environment and where they fit into the protection of it. Read more about Protecting Earth, One Middle School at a Time. 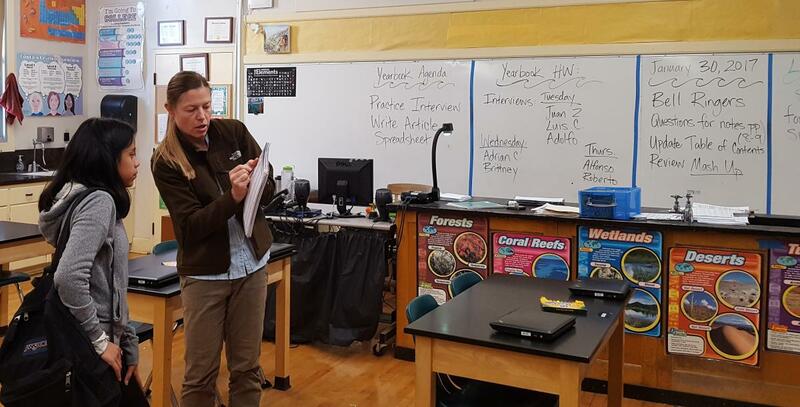 Nestled in one of the most remote areas of West Virginia known as the Birthplace of West Virginia, you’ll find an incredible teacher who opens up the world to her AP Biology high school students. Kathy White, has been transcending socio economic barriers for 27 years at Pocahontas H.S. Find out more about how she inspires students to pursue a lifetime love of science and sense of environmental protection. Every time we go to the National Conference for the National Science Teachers Association we become inspired and stoked about our work. It’s the one-on-one conversations we have with science teachers that brings us the greatest satisfaction. One such conversation was with Barbara Shannon. Currently, Barbara is the Director of STEM Education for Synergy Academics whose mission is to create solutions that eliminate the achievement gap. But, before that, Barbara spent many years teaching science to kids in the Los Angeles Unified School District (LAUSD).